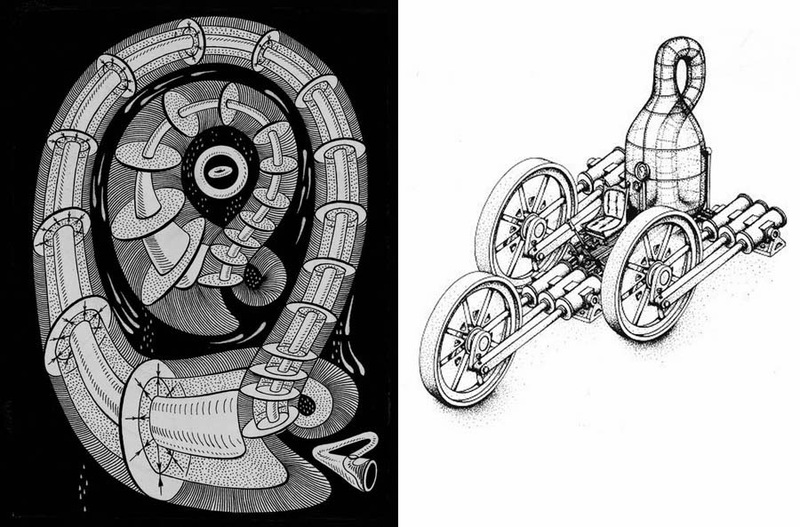 A geometric enigma, a convoluted mind-bender dropped upon us from the wonderful extra-dimensional realm of topology, the Klein Bottle is perhaps even more popular with artists and architects than the ubiquitous Moebius strip. In fact, the Klein Bottle is what happens when you merge two Moebius Strips together: the resulting shape will still have only one side - with its inside and outside merging into one! The Klein Bagel: do you want cream cheese with that? The whole gallery of 3D models by Torolf Sauerman (also known as "jotero") is worth looking at (and drooling over the possibilities of 3D printing it for your office) - click here. He also runs a YouTube channel full of topological animations. 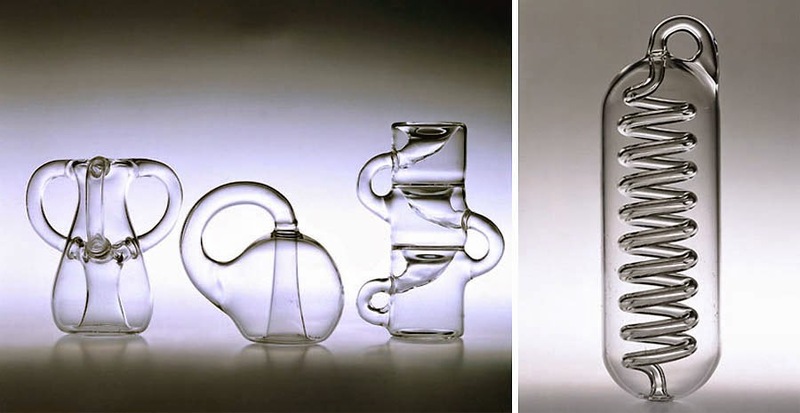 These are the "two single surface glass vessels made by Alan Bennett in 1995. Part one is a double loop Klein bottle which when cut gives a pair of three-twist Moebius strips. 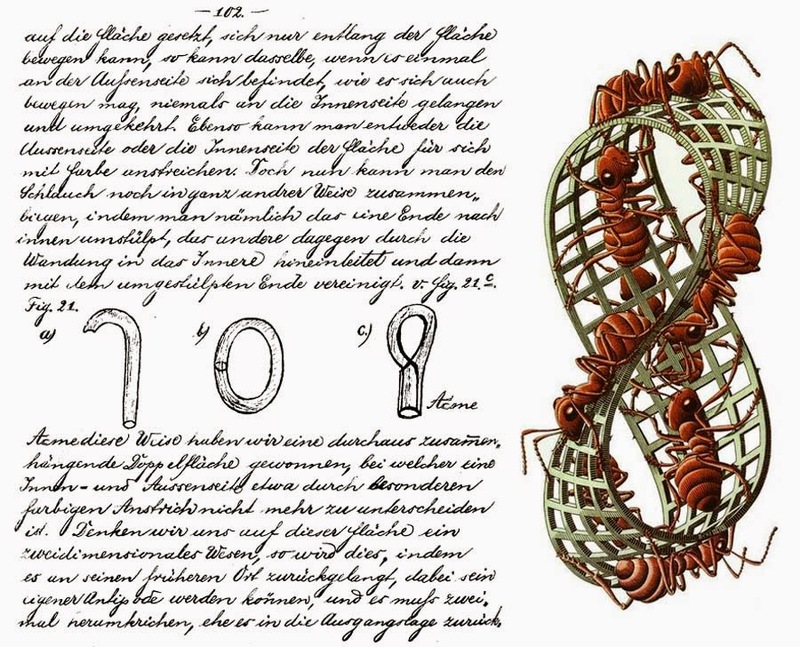 Part two is a triple loop Klein bottle which when cut gives a pair of five-twist Mobeius strips." Do you want your Klein object DOUBLE, or TRIPLE? 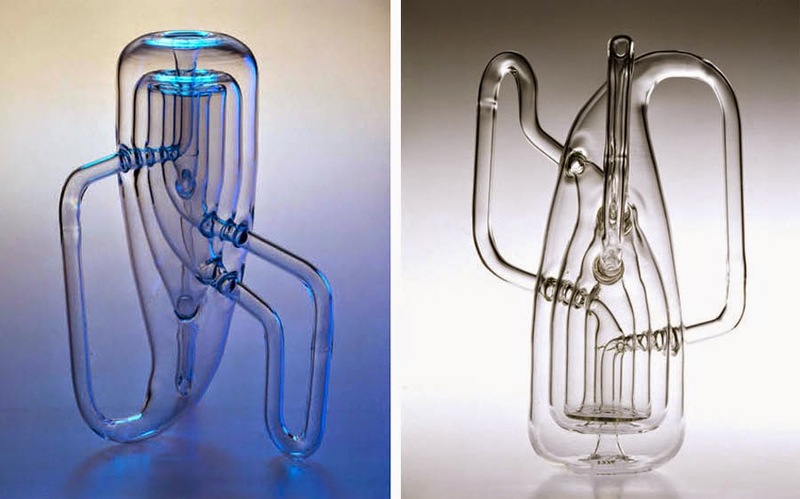 Produced by the same "Acme Klein Bottle Company", the double Klein bottle looks much like an hourglass - it was featured on the cover of the book, "Endless Universe" by Paul Steinhardt and Neil Turok. Both double and triple bottles are externally linked in this case, but it is also possible to link them internally. 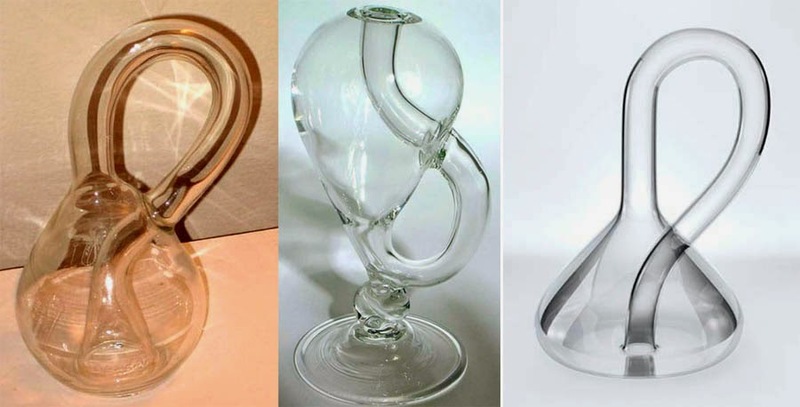 "The Wine Bottle Klein Bottle is difficult to fill with wine, because of vapor-lock. 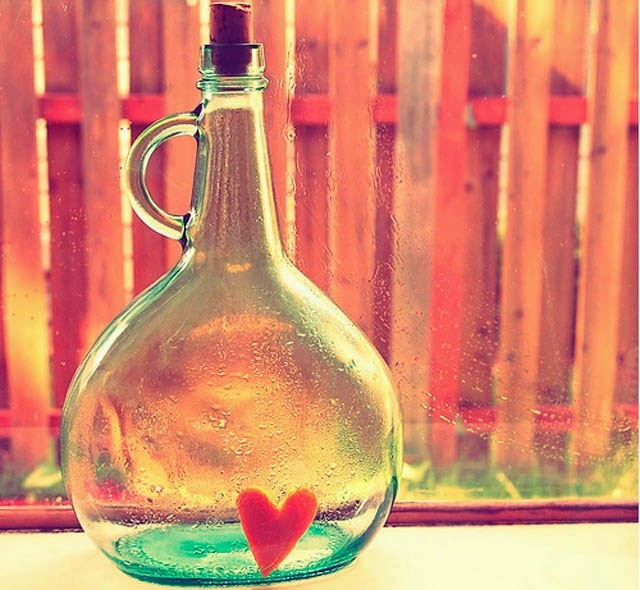 As you pour water (or wine) into it, there's no place for the air to go. So the wine is trying to go down while the air is trying to go up the spout. Result is slow filling. Pouring wine out is equally frustrating. Not only are these difficult to fill and empty, but cleaning them is a real challenge. 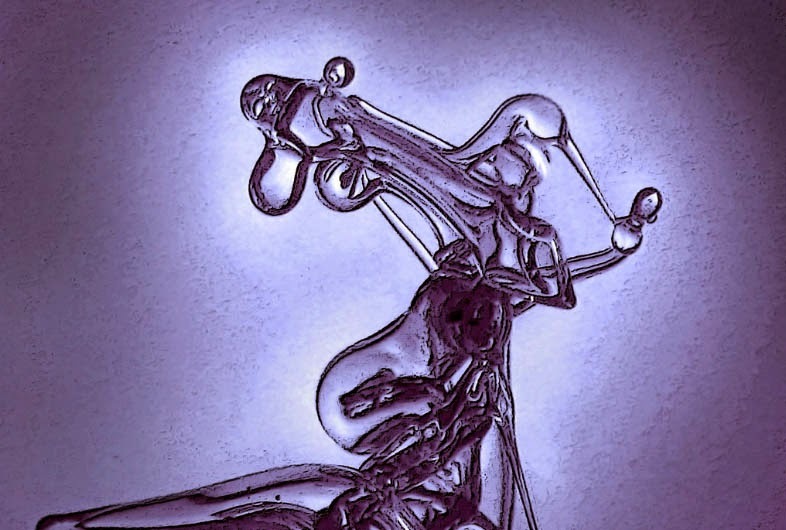 Since there's little air circulation within the Klein Bottle, moisture doesn't evaporate. Worse, you can't reach in with a towel. So you'll need to dry the interior surface using alcohol. I've had good luck with a pair of small magnets wrapped in cotton cloth." ... or, perhaps, even TRIANGULAR? The Klein Bottle House was built by architects McBride Charles Ryan just outside Melbourne, Australia, has all the trappings of a science fictional dwelling and mathematical Garden of Eden for those who like their brains and sense of orientation challenged - but it also looks surprisingly liveable and warm (more info). 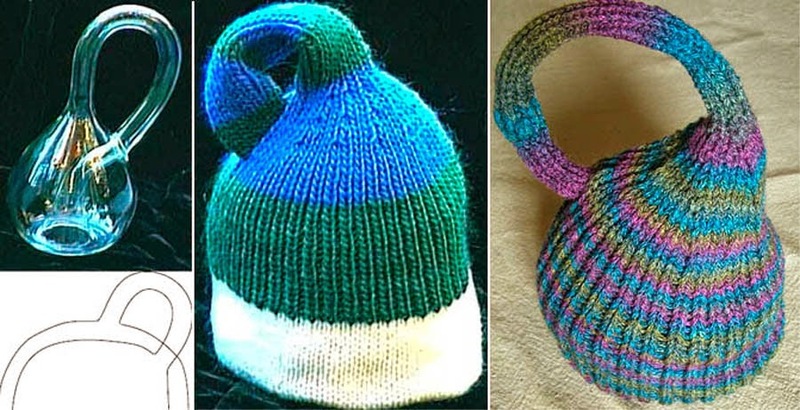 The Klein Bottle Playgrounds: Just don't end up with arms and legs tied in a topological knot! 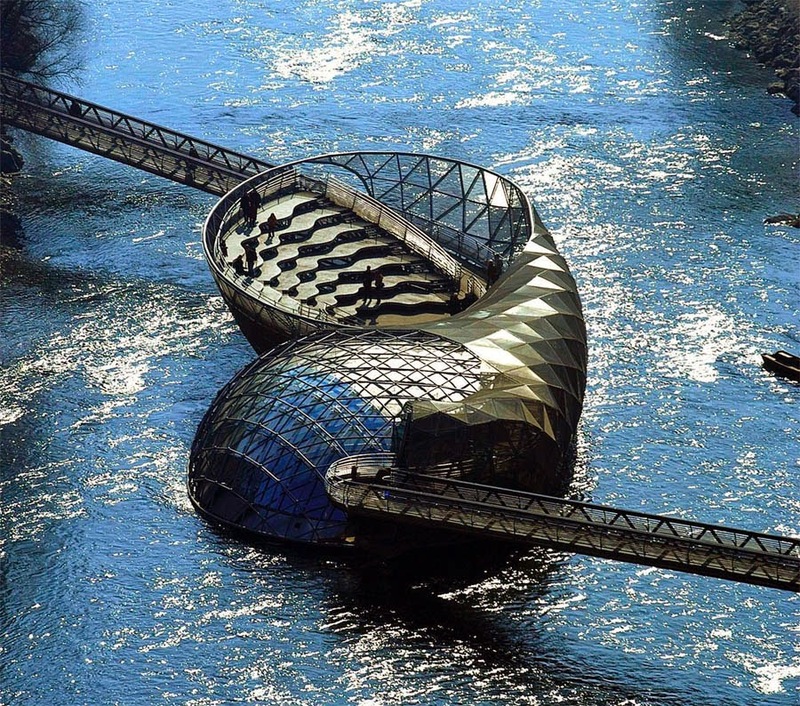 On the right image above you can see another mind-boggling park installation by Vito Acconci, perhaps even more sophisticated and original. Sophisticated mathematical knots make up great knitting projects! I wonder if you open a wine bottle with a physically impossible bottle opener (made by Bathsheba Grossman), would that lead to some miracle while drinking the wine? Perhaps the wine would never run out? I can only dream. 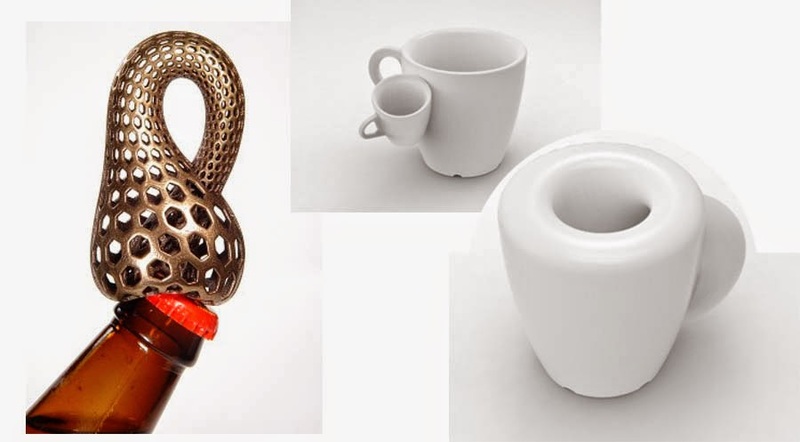 Similarly, impossible topological coffee cups should lead to a never-ending supply of coffee inside (siphoned from some helpless extra-dimension, straight into our coffee-starved reality). The cups on the right were made by Cunicode, a design agency in Barcelona, which came up with a unique cup for each day (a new coffee cup design every 24 hours); see lots of them at this link. 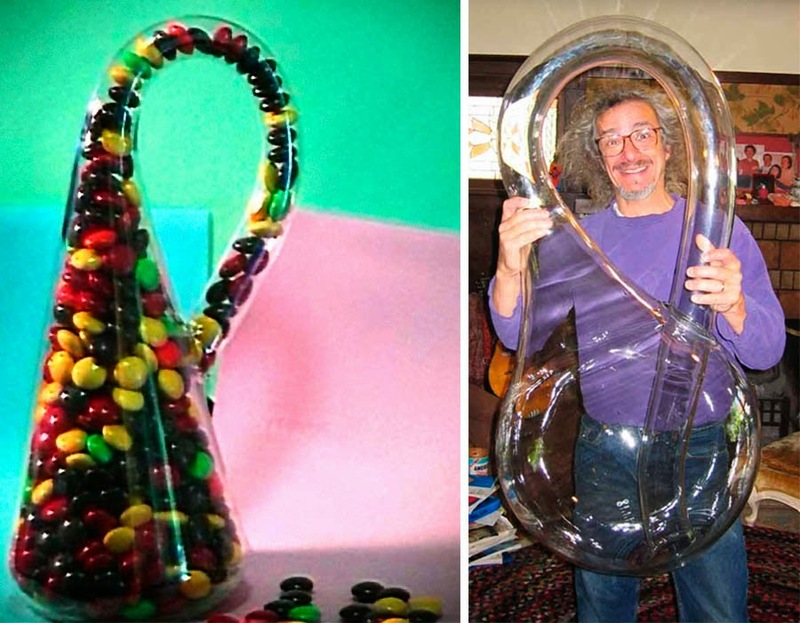 Right image above shows the BIGGEST Klein bottle in existence: 1.1 meter tall, 50 cm diameter (the size of a 5 year old child) - made by the same Acme Klein Bottle Company. 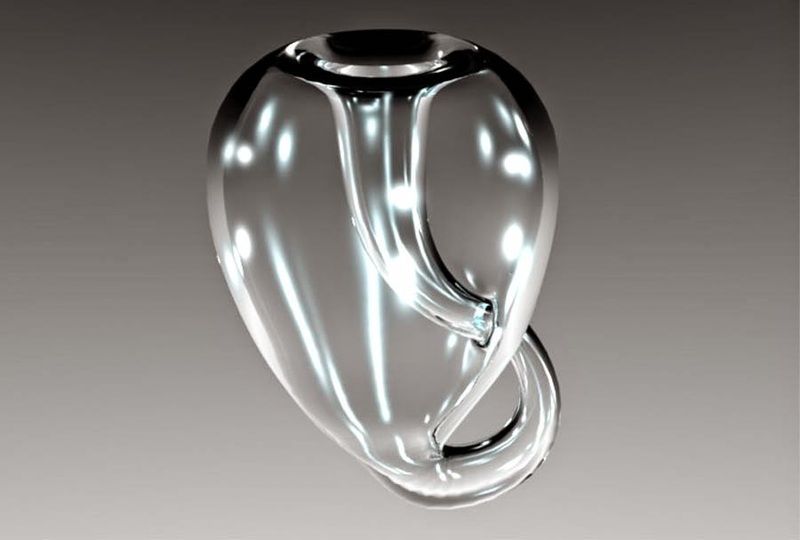 Here is the Klein Bottle - SQUARED!